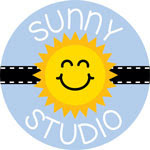 The Cast and Crew for Gina K. Designs welcomes you to day two of our blog hop celebrating the new stamp sets from the May StampTV Release Party. Hold on tight! 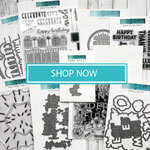 Today, we are featuring two stamp sets by Beth Silaika and Claire Brennan. Oh Sophia just makes me giggle everytime I see her, so cute!! LOVE your rose card! Beautiful job! Love the splash behind the circle! Sophie is always having fun! 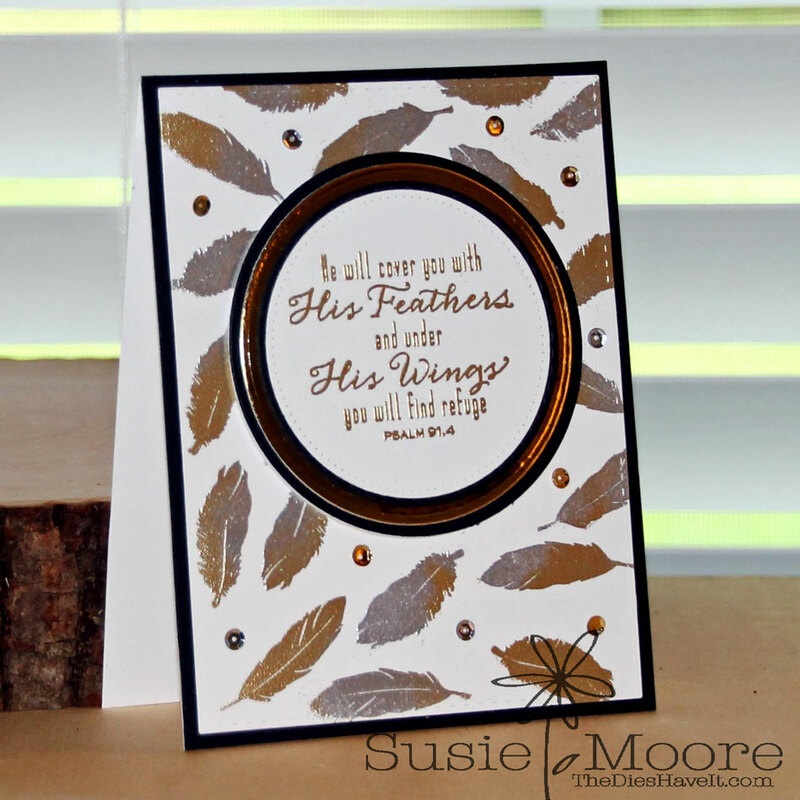 And I love the copper pewter background with the feathers! 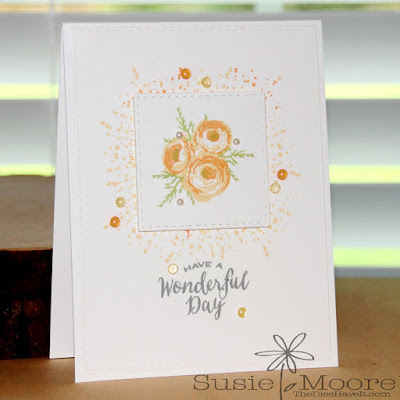 I love how you used splatter on both those cards!! The piggy is so cute and placing her in a mess is precious. Love her hearts the way you colored them. The feathers are lovely with the two tones colors. Love the roses. Love all your cards. Thanks for inspiring us with your creativity. Cute little piggy! The rose card is fabulous! OK Susie, how did you get your splatters or perfectly haloed around your centers? These are fabulous! Love the PIG! Sophie Pig is stealing the show today....on all of the blogs....she is just so cute....next purchase for me for sure...thanks so much for sharing your lovely work. Lovely card! I have to say - I love that pig! Beautiful cards, love all of them. Thanks for the inspiration! I couldn't pick a favorite from those cards, TFS! Very Sweet Cards, I love the circle main vision point! Each of these is wonderful. I love your use of the splatters. Your cards are wonderful. I believe my favorite was Have a Wonderful Day. The colors and techniques were great. Thanks for sharing your skills and talents. Awesome cards - love the splatter on the two cards. Thanks for sharing. Awesome cards and I love how you colored Sophie. So darling! Such pretty cards! Love them all!!!! I love these cards! Beautiful. 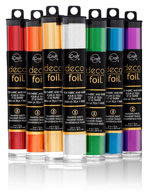 Oh these are lovely Susie, I am itching to find my metallic embossing powders now! Love Miss sweet-cheeks Sophie! The roses are just lovely, such a dainty card! Hugs! So many great cards. I love the one with 3 yellow roses. Hi Susie, I think your card with piggy showcased in the circle with what I presume are mud splatters surrounding it is so much fun. 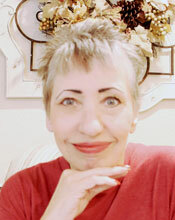 Hope you are enjoying being part of the Gina K crew, because I want to see more of your designs. Love your cards. Love the splatter under the main image. Love the splatter background behind Sophie and the beautiful roses. The feathers make a beautiful background. Beautiful cards. You guys are all such talented folks. Thanks for sharing. Your roses are so soft and lovely. Thank you to everyone for leaving such kind words on my blog today. I can hardly wait to see what each of you creates. I do hope you will share! 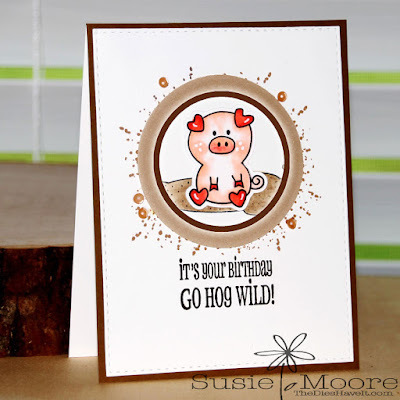 BEAUTIFUL CARDS - LOVE YOUR USE OF THE SPLASH BACKGROUND - AGAIN YET AGAIN - MY PIG CARD IS THE FAVORITE - LOVE YOUR COLORING! Love the hearts for Miss Pigs ears and feet. Very cute. I love the pig card! That stamp is so cute! A great job on these cards. 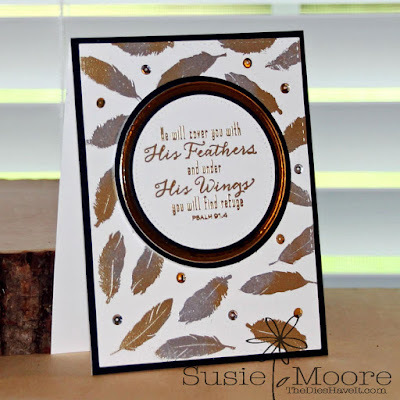 Your feather card is just stunning! Susie: Is Sophie sitting in a puddle of chocolate? I have many friends who crave chocolate, so surely I would be able to use this design. 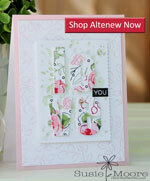 Your "Old Country Roses" are a very nice variation from all of the others, as is your "Fine Feathers" card design. Love how each of your cards has a center "medallion" for the focal point. Super creative use of Tiny Textures, too. Great cards. Can't wait for my stamps to arrive! Fabulous. I like how you framed these images.